Do you have broad shoulders and/or a full bust and small hips and thighs? If so, then you have an inverted triangle-shaped figure type. Inverted triangle figures can be any size; it's the shape that determines the type. Although the inverted triangle is the least common petite figure type, this shape is the envy of others because a full bust and wide shoulders bring emphasis to the top of the figure, rather than the hips and thighs. Black - a dark color. Strapless dress, which shows off beautiful bare shoulders. Sleek high heels, a great style for short women. When dressing to flatter figure, your main challenge will be to balance your figure so that you don't look top-heavy. Try to achieve a look that mimics an hourglass shape. Strategize your style so that you emphasize your lower body and minimize your top half. So avoid styles that tend to over-emphasize the top. For example, if you wear puffed sleeves, your top will look even bigger and make you look more out of balance. Strive to achieve a more balanced look, and create some waist definition by calling attention to your slimmest areas from under the bust to your waistline. In our example pictured above, although this isn't a terrible look for Alyssa Milano, it could be better. The puffed sleeves and light ivory color of her blouse are both features that emphasize her inverted triangle-shaped figure. Dark-wash jeans with straight legs work well for most petites, so to balance this look, a sleeveless dark top would do the trick. Strategy Strive for balance so that your figure appears more like the ideal hourglass figure. Look for tops that won't make you appear bigger on top while maintaining the look of a defined waistline. At the same time, look for style details that will help you look taller. Color Wearing a dark color on top will help make the top appear a bit smaller. Shaping If a very large bust looks quite disproportionate, wearing a minimizer bra will make for a less top heavy look. Necklines V-necklines and U-necklines are good because they add height. If you have an inverted triangle-shaped figure, avoid boatneck styles because they visually widen your top. Waistline Make sure that any top you select gives you the appearance of a defined waistline. This may either be at your natural waistline or under the bust with an empire style top. If the top has an under-bust seam or band, it should fall under and not across the bust. You may need to go up a size so that tops will fit properly in the bust. Sleeves Select narrow sleeves that extend at least to the elbow, and avoid short cap sleeves, flutter sleeves, or puff sleeves because they widen your shoulder line. Sleeveless styles usually look best on women who have slender, toned arms. Lines Surplice styles, princess seams, and vertical or chevron stripes all add to the illusion of height, so they are also desirable. What to Avoid Stay away from off-the-shoulder styles, details at the shoulders, and big shoulder pads. Also avoid shapeless styles with no waistline, chunky knit fabric, and high necklines. In the example pictured, the petite navy top from Banana Republic (Buy Direct) would flatter a short woman with an inverted triangle-shaped figure because of the dark color, the V-neckline, and the narrow three-quarter length sleeves. Finding a jacket to fit an inverted triangle-shaped figure can sometimes be challenging because many jackets feature thick shoulder padding and extended shoulder lines, neither of which works very well for a short woman who has an inverted triangle-shaped figure. Classicly styled single-breasted jackets, which are fitted or semi-fitted to give some waistline definition, can be a good choice as long as the jacket's style doesn't emphasize the shoulder line. Look for jackets that button to form a flattering V-neckline, rather than jewel-neck or mandarin collar jackets. Jackets with princess seams give a nice vertical line that flatters short women, and peplum jackets work well because they balance the figure by enhancing the hip. Avoid bolero or cropped styles. 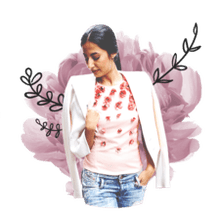 Women who have inverted triangle-shaped figures have the only figure type that actually benefits from more hip emphasis, so jacket details that fall below the natural waistline, such as patch pockets, will help balance the figure. In the example pictured above, the single-breasted, semi-fitted jacket from Shopbop (Buy Direct) features a shallow V-neckline, single-breasted styling, flattering three-quarter length sleeves, dark color, and peplum. If you have an inverted triangle-shaped figure, you're able to wear skirts that have more fullness. In fact, yours is the only petite figure type that really can wear fuller skirts well. Fullness in a skirt enhances the hips, which you can afford to do in order to balance a larger top. Other skirt styles that will work for short women who have inverted triangle-shaped figures are A-line styles and pegged skirts. A pegged skirt is narrower at the hem than at the hip, and this type of styling makes the hips look larger. Consider the length of the skirt because when the hem of a skirt falls across a thick part of the leg, either thigh or calf, it makes you look wider and shorter. However, many short women who have inverted triangle-shaped figures also have slender legs. In that case, you may be able to wear a mini-skirt, but avoid mini-skirts unless you do have slender legs. Otherwise, keep the skirt length around the knee at the most flattering length. In most cases, the best skirt length for short women is just above the knee, at the knee, or just below the knee. If you're wearing a pegged skirt, it's essential that the hem be above the knee so that you're able to walk in it. If you wear boots with a skirt, the boots should be high enough and your skirt hem low enough that there's no gap between them. This gives you an unbroken vertical line and helps you look taller. In our example above, the purple skirt, available in petite sizes, from Gap (Buy Direct) features smocking detail at the hip, side pockets at the hip, and fullness in the styling, all features which will emphasize the hips. Dark-colored pants with straight legs work best for most petites because they give short women a more slender and taller appearance. If you're 5'0" or under, you may also need to find pants with a shorter inseam than regular petite pants have. If you have an inverted triangle-shaped figure, you can wear pants or jeans with pocket details to enhance your hips. You're also able to wear tapered pants or jeans, which will make hips appear larger to balance out your top. If you're also a tiny petite with very slender legs, you may be able to wear skinny jeans. Because of your small hips, you're able to find jeans that fit more easily than women who have other figure types. These petite tapered jeans from Lands' End feature a traditional at-the-waist fit, classic style, and rinsed dark indigo color. The tapered jeans are available in petite sizes 2-18, and there are three inseam options for these petite jeans--26", 28", and 30"--so that gives petites plenty of flexibility. Another neat feature is that you can try them on a virtual model to get an idea of how they would fit you. Wrap Dresses Wrap dresses, which form V-necklines, work well for the inverted triangle figure type. Avoid puffed sleeves and ruffles on a wrap dress so that the top won't look larger. Sheath Dresses with Pegged Skirts A well-fitting sheath dress with a pegged skirt to make hips appear a bit more in balance with broad shoulders is another workable style for the petite woman who has an inverted triangle-shaped figure. Dresses with Hip Detail Dresses with hip detail, such as a ruffle or pockets, also put more emphasis on hips and help balance the shape of an inverted triangle figure so that it looks more like an hourglass. The white silk dress pictured above from Fernanda Carneiro Designs features a flattering V-neckline, sheath styling, and ruffle at hip, all style details that flatter a woman with an inverted triangle-shaped figure.